First player in line starts in triple threat, then sweeps and takes a long, explosive first step, dribbles, takes two steps and finishes with a layup with their outside hand. Rebounder grabs ball and heads to back of layup line, while player who just took layup heads to back of rebounding line. On the right side, players will sweep the ball off their right hip, taking a step forward with their right foot and pushing the ball out with their right hand. On the left side, players will execute a crossover step, starting with the ball on their right hip before sweeping across to their left hip as they take a step forward with their right foot to the out side. Left handed players will be using the opposite footwork. 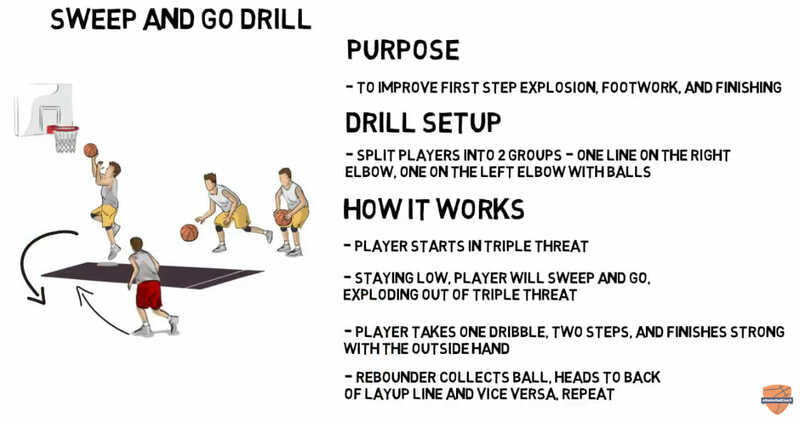 Feel free to add variations, with jab steps, pull up jumpers, or double moves to keep the drill interesting and challenging for your players!